Pets Costs > How Much Does a Ferret Cost? How Much Does a Ferret Cost? According to everythingferret.com, a ferret is a “member of the weasel family and a descendant of the European Polecat. Some other members of the weasel family are minks, otters, and the endangered Black-Footed Ferret.” While ferrets are working animals in some countries, in the United States they are most often just considered lovable pets. Ferrets require a lot of exercise, free play and can be harder to take care of than a domestic cat. Most claim, however, that they are much more fun and active. The cost to purchase a ferret can be anywhere from $100 to $500. The costs will depend on where you purchase it, the type, age, quality and geographical location. Private home breeders tend to be a pinch more, and they can cost upwards of $300 to $400. PetCo, for example, often offers ferrets for sale, with prices ranging from as little as $100 to more than $175. According to myferretpet.com, she spent $175 on the cage and another $500 for the items necessary to care for the ferret. All in all, she already spent $675 in supplies before even purchasing the ferret. Because ferrets are very playful animals, they enjoy playing with toys. Ferret-specific toys can be purchased at toy stores and will usually cost around $10. If you are going to travel with your ferret, you will need a travel cage. This will cost approximately $15 to $30. Some ferret owners use a leash and harness to give their ferret the exercise it needs. If this is the case, plan on spending about $10 to $15. Both male and female ferrets do need to be spayed and neutered. Some ferrets are also descended. This is sometimes already done when purchasing your ferret. If not, it will cost the owner between $75 and $250. Ferrets also need routine veterinary checkups for things such as teeth cleaning, heart work medication, vaccinations, etc. The average yearly cost for routine veterinary visits is $90. The first checkup should be around $70 to $100. Plan on budgeting at least $50 for annual shots. Ferrets are susceptible to several types of cancer and serious diseases such as canine distemper. Overall, plan on budgeting at least $600 to $1,000 for the first year. After that first year, supplies, food and litter should cost around $15 to $30 per month. Don’t forget to set aside a few hundred dollars to help with emergency vet bills if they pop up. On average, a ferret is going to live anywhere from 6 to 12 years. Males are generally going to be larger than a female. A male can grow up to 16 inches, while a female can only grow up to around 14 inches. Just like a cat, a ferret can sleep up to 18 hours a day. If the ferret is new to the household, it can eventually learn to adapt to its owner’s schedule. While these ferrets have a poor sense of sight, they have phenomenal sense and smell. Because of their skin glands, a ferret will emit a rather unique, musky odor. Many think that bathing can get rid of this smell, but it won’t work. 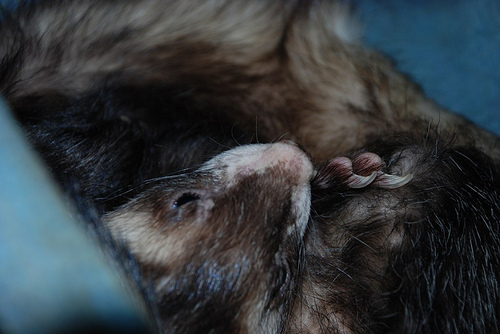 One of the most common ways to get rid of this odor is simply by removing the ferret’s scent glands. If the ferret has been home-raised, there’s no need to descend them. Common diseases that ferrets can encounter include adrenal disease, insulinoma, Aleutian disease and the flu. To learn more in-depth about the ferrets and how to take care of them, Ferrets for Dummies is a fantastic read. Some states require you need a license in order to keep a ferret as a pet. For example, California forbids owning a ferret with the exception of a neutered male and penalties may apply if you’re caught. If you’re unsure, contact your local Humane Society for more information. A healthy ferret will be active, sleep up to 18 hours per day and will have a shiny coat. Monthly baths are recommended to get rid of the ferret’s musky odor it develops. The nails should be cut every two to three weeks. It has a white coat with a pink nose. They love to be active in the morning and are commonly found as a therapy pet for the elderly. It has a deep colored black coat and its head has a “hood-like” mark. Can come in varied colors, but it’s known for its distinctive white stripe that runs between the eyes. Has a chocolate coat with a white undercoat. The eyes tend to be pink or a light brown. As the name suggests, it has a darker brown coat with a red hue. These ferrets will have a brown to pink nose and black eyes. This ferret has a reddish-brown coat with a pink nose. Similar to a Dalmatian dog, these ferrets will be primarily white with dark black spots. These ferrets have a silver/gray coat with a pink nose and blotches under the eyes. Resembling a panda, these ferrets have a white head, white coat and are known for its saddle shape. Coming in various patterns, the light pattern ferret commonly comes in white with darker hairs spread out. Similar to the light pattern but will have darker spots. The sable will have a dark face and undercoat with various shades. These ferrets have a V-shaped face and its coat will have darker colors. The striped white primarily have a white coat with a darker line running along its back. One way to save money on a ferret is to get it from a previous owner or an animal shelter. These ferrets will usually have current vaccinations and already be spayed or neutered. Purchasing used ferret equipment, such as the cage and feeding bowls, can also cut down on the costs. eBay is a great website to check for used equipment. Since bedding will have to be replaced every few weeks, consider using older t-shirts instead of the bedding you purchase in the store. Check with your local state and city. Some cities have banned this type of animal and won’t allow it. Ensure that this animal is allowed within your area before making a purchase.